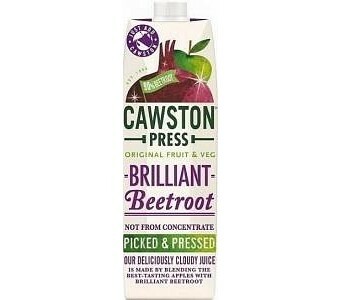 Cawston Press Apple and Beetroot juice is a refreshing blend of pressed fresh apples infused with beetroot goodness to create a beautifully balanced fruit and vegetable drink that is a great source of vitamin C, so the whole family can enjoy it. Cawston Press Apple and Beetroot juice is the perfect refreshing drink as apple and beetroot will put an extra spring into your step. So start your day off right with a glass of Cawston Press Apple and Beetroot juice or enjoy with your evening meal. Not from concentrate No added artificial colours Contains no artificial sweeteners No added artificial preservatives or colourings Ingredients: 90% pressed beetroot Juice, 10% pressed apple Juice, vitamin C.